These past couple weekends, Piper has been having fun on her "farm". In our vegetable garden this year, we are growing zucchini, yellow squash, string beans, peppers, tomatoes, cucumbers and pumpkins. I have decided to add to my list of hobbies and learn a little more about canning. My husband canned while growing up, so he knows a lot about it. I have only canned once, and it was with him a few years ago. 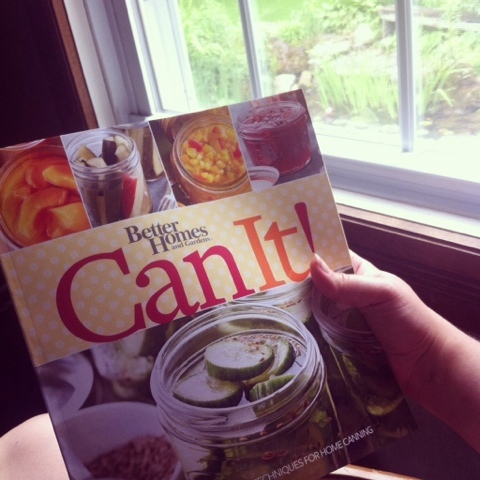 I bought a new canning book this weekend called "Can It!" and I'm excited to learn more! I'm already dreaming about harvest, but I'm enjoying the season we're in so much! We are having lots of fun and summer hasn't even officially started yet. Where's the pause button when you need it? P.S. Please don't tell anyone but I think I have a major crush on Piper's dad. He's pretty amazing. Readers, have you ever canned before? What do you love to can? Do you have any canning book recommendations?